Whether you’re running out of room on your current hard drive or you’re finally making good on a new year’s resolution to start backing up your data, there’s never been a better time to upgrade to a massive 1TB worth of storage. The Western Digital My Book Studio Edition allows you to easily stow away those precious digital memories and still have room left over for using Leopard’s Time Machine automated backup feature—all without breaking the bank. About the size of a stubby desk dictionary, the gray My Book features ports aplenty. There are two FireWire 800 ports (an adapter cable for connecting to FireWire 400 devices is included) and a mini USB port; an eSATA (external SATA) port is also included, but you’ll need to buy an add-in card to realize its faster speeds. There’s a thin blue activity bar on the front that also doubles as a capacity gauge, though only when the drive is connected via USB or FireWire. The drive also features a port for a security cable. To operate the My Book, you simply cable the drive up to your Mac using an available port, plug in the power adapter, and press the power button. The drive comes preformatted for the Mac, and mounts immediately on your desktop. To use the capacity gauge and power save features, you’ll need to install the supplied WD button manager software. 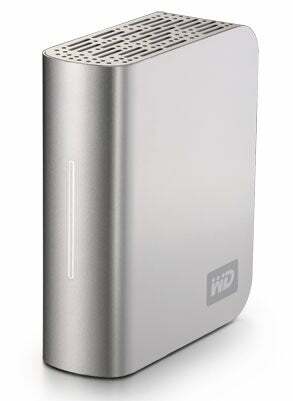 The drive comes bundled with WD Anywhere Backup, which is a Western Digital-branded version of Memeo’s LifeAgent backup utility. Although the drive was not the fastest of those we tested in a recent roundup, it delivered very good performance and was a good value compared with other drives with the same 1TB capacity. In addition to the 1TB version we looked at, the My Book Studio Edition is also offered in 320GB, 500GB, and 750GB capacities. The combination of features, compact design, good performance, and price make My Book Studio Edition (1TB) worth a look if you’re thinking of adding more external storage to your Mac.